If you have read “The Very Hungry Caterpillar” by Eric Carle, you know that it’s all about numbers (and eating). The book offers opportunities to explore ordinal and cardinal numbers, beautiful illustrations to count and discuss, and of course, you can have the talk about healthy food versus junk food. Then there’s the science – no child can hear the story without asking HOW the caterpillar turns into a butterfly. The first run I am suggesting is to go with “The Very Hungry Caterpillar.” The distances I’m listing are for grown-ups running a workout, but you could easily do it with your kiddos by shortening the distances to age-appropriate segments and overall distance. Just as the Caterpillar in the book starts out eating through one apple, then two pears, and so on, we will do some track intervals: Start out with one 1200, then two 600s, then three 200s, and four 100s. Do five pick-ups (100 meters where you start slow and easy and accelerate so you hit the finish line at full speed) and then do a series of core and strength exercises (you pick the quantity in each set) instead of “one ice cream come, one pickle, one cupcake” and so on: I recommend planks, tricep dips, high knees, crunches, push-ups, plank twists, burpees, and of course, inchworms. After all this, go for a nice, easy mile – four laps around the track, and the next day, you’ll feel much better. This run is to go along with “The Artist Who Painted a Blue Horse.” This book is all about celebrating art and perspective, and the intersection of the two in what we can create. This puppet production is an all-ages show, which means that I finally get to take my just-turned-3 little man to a play. I’m also really excited to see how he reacts to the stories, which he knows, and see what he takes with him compared to what are his favorite parts in the books. 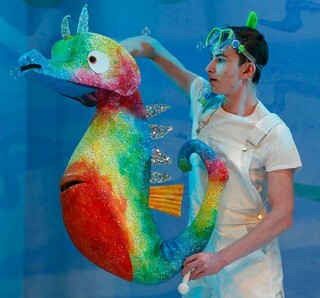 The production uses music, light, and color in addition to beautiful puppets, so I think he’ll get lost in the story. 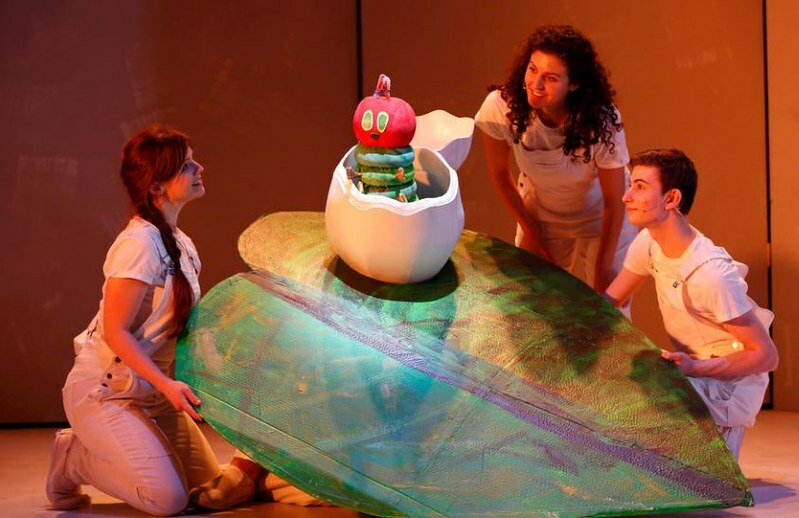 The play was first performed in Australia in 2015 and has since traveled the world, and uses 75 puppets, expertly animated by a cast that includes Robert Amico, Robi Arce, Allie Menzimer, and Summer Olsson. As with all OCT productions, there will be a fun activity to engage the little ones before the show. It’s a good idea to get there early – I’m planning on 45 minutes – to pick up my tickets, climb the stairs a few times, and do the craft activity they have set up. I also suggest, if your little one is quite little, renting a booster chair from the coat check area. It’s only $1 and well worth it so they can see. I got one last time for my almost-6-year-old and while she may have been fine without it, she thought it was pretty cool. You won’t need to worry about finding your seat by yourself – the playhouse is well-lit before the show starts and volunteers will show you exactly where to go. Just make sure to use the potty first … just in case. The show runs 60 minutes and offers two shows on Saturdays (at 2p and 5p) and two shows on Sundays (at 11a and 2p). There are two special productions of this show as well. On April 7 at 2p, there will be an ASL-interpreted performance (these are amazing as the interpreters really get into the production). And there is a sensory-friendly performance on May 5th at 11a, at which the lights will remain on for the play, extra space will remain between seats, and a designated movement area for kiddos who would rather be able to walk around during the play. And as always, audience members can get their playbills signed by the cast after the play. I personally can’t wait to take my favorite 3-year-old to this play. We have a number of Eric Carle books (Brown Bear Brown Bear is his favorite), and ever since I told him we were going, he’s been asking, “Can we go to tatter-pidar today?” We’re going to turn it into a “date day” complete with lunch at McDonald’s … but only after I get a good run in that morning, of course. Discounts available for groups of 8 or more.